Uringe – the end of the summer? 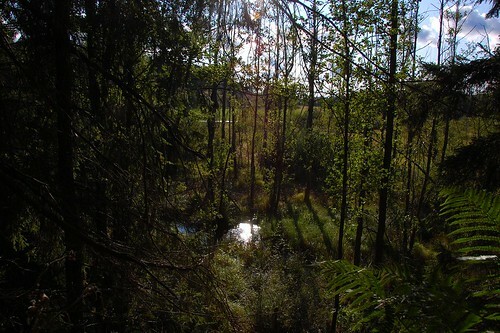 - Joakim A.
Uringe – the end of the summer? Not this past weekend but the weekend before that, the Sunday the last day of August, me and Camilla took the long drive from Uppsala to the south of Stockholm to a crag called Uringe. The last few times we had been outdoors I had performed poorly, so the idea was to go somewhere new and someplace with lots of routes in a good grade range. Uringe has quite a lot of routes around 6c, with a few easier routes for warming up and a lot of 7b-ish routes as well. The weather forecast was promising, which naturally turned out to be wrong, already on the way there it started to rain. But luckily it hadn’t rained south of Stockholm so it was a good thing that we didn’t turn around. We started off with the “new wall” where Mattias Hamlin created three new routes last year. We warmed up with Sicksack 5c which I onsighted easily even if the route felt a bit odd. 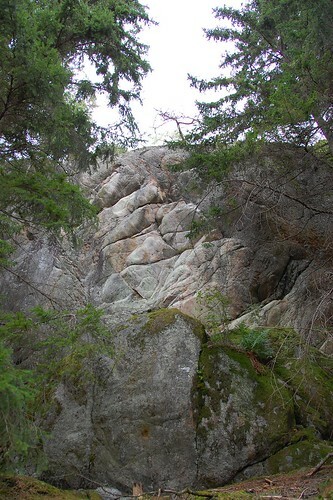 Next up was Det lilla äventyret 6c, a two-starred route that looked fun and nice from the ground. I did the start easily enough, then it got somewhat tricky a bit up when the feet had to leave the large plateau, but I pressed on through the tricky section with bad hand holds and was rewarded with good holds and a rest. 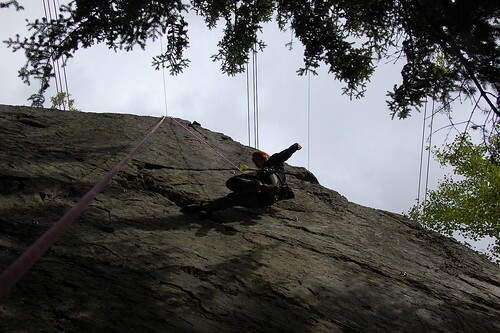 Next up a long reach with crappy foot holds, then another reach up to a crack and a bit of crack climbing to the top. I’m more than half way up now so I summon all my stubbornness and continue. I refuse to give up, even when it hurts with my left hand jammed in the crack. An off-balance foot placement, a high step back into balance, then reach up with the hands and I’m at the anchor! Yes! My first 6c onsight didn’t feel that bad. I have been pondering and analyzing this and I think what I did different from other attempts was that instead of hesitating when it got difficult I pushed on and got through the harder section. For some reason I had the confidence this day to do it because I felt totally in control. I knew that I was going to make it, that I wasn’t going to fall. So instead of getting more tense at the crux I was totally relaxed and climbed perfectly. I hope I will be able to bring back this feeling. Climbing is so easy when you feel this way! After lunch I continued with onsighting Filuren 6c. That route wasn’t as nice due to being quite uneven. A few harder moves with quite easy sections in between. 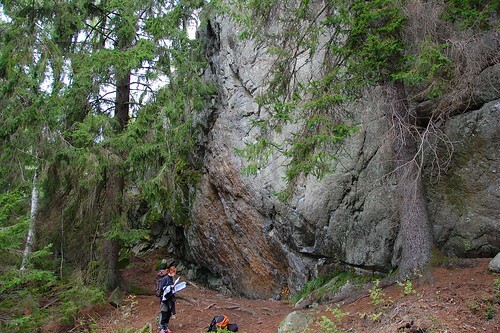 As we had done all routes on the wall we moved down to the old wall and I onsighted the leftmost route, Okänt 6a+, where the start requires a bit of power and a high pain threshold as the holds are sharp. The top part was rather nice to climb though. To finish the day we wanted to climb something on the fun looking smooth wave-formed section of the rock. We settled for Girburken 6c, an overhanging power route on a mix of slopers and jugs. A bit too optimistic as I had already spent most of my energy earlier, so I wasn’t even close to onsighting it. I got up with a few hangs though and I’ll have to do it properly next visit as it’s a brilliant and fun route. The sun came out in the late afternoon when we were leaving and suddenly for a short moment it felt like the summer wasn’t all gone.